You lied to me Cat in the Hat. I TRUSTED YOU!!! Now, having a fifth grader in the same school, I was already familiar with the school’s library and have always been quite pleased with the selection of books and how well my sons’ school utilizes the library as a resource class (and not just a room where you can get books if you want). One of the books my five year old brought home, though, set me off in several ways. I shall enumerate them shortly (with pictures!). I plan on talking to the school librarian (who is a wonderful woman) about the lack of positive reasons to keep this book on the shelf, but I digress. 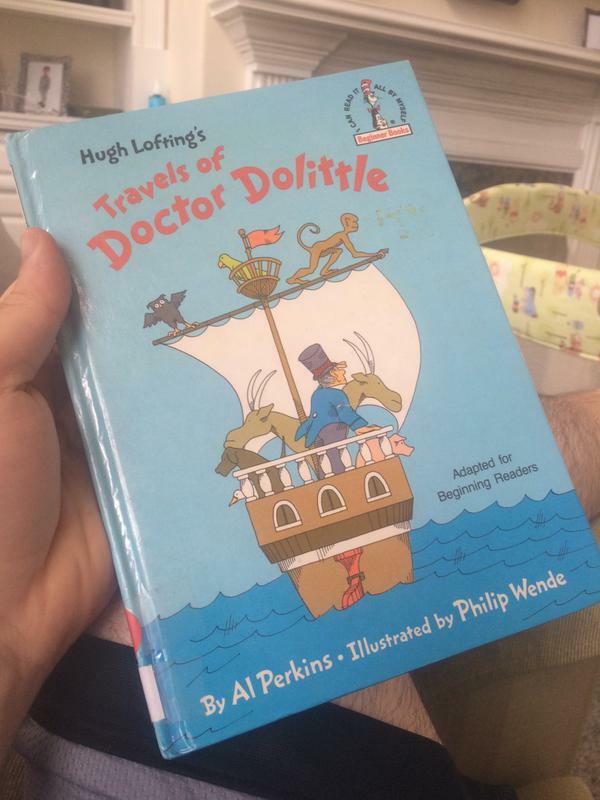 The book in question is an adaptation of Hugh Lofting’s Travels of Doctor Dolittle which was done by Al Perkins and illustrated by Philip Wende and is part of Random House’s Beginner Books series (you’ll note the happy Cat in the Hat branding on the cover). 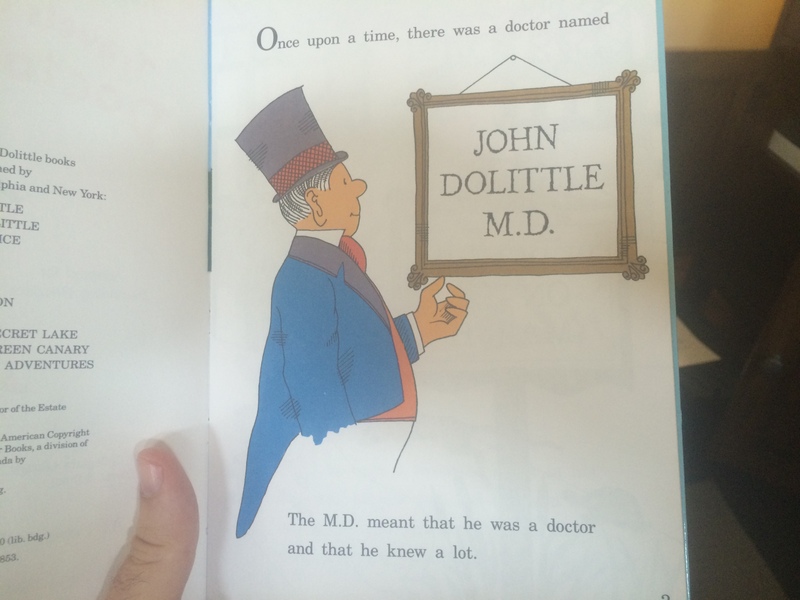 For any who are unaware of Doctor Dolittle through either the books, the 1967 Rex Harrison film adaptation, or (more likely for younger Americans) the Eddie Murphy “adaptations” (I use quotes because aside from “he can talk to animals” the adaptation is quite loose), it is a children’s book series about a physician who is taught how to talk to animals and thus becomes a world-traveling veterinarian. The mask must chafe when he sleeps. Let it not be said that the original book is not without controversy in the modern age. The depiction of Africans is very much representative of early 20th century racism. This book attempts to correct and avoid this problem by making the Africans… into… voodoo priests? I guess. They look like something out of a Crash Bandicoot video game. This edition was published in 1967 so clearly they updated it in an attempt reflect the times but they kind of missed the boat on that one (also, they are orange instead of black or brown, suggesting the king may be John Boehner). I will give them credit for ignoring the sub-plot of the African king’s son helping them escape home in exchange for bleaching his face white, however. One major problem with the handling of the Africans, though, comes in the form of motivation for why the king detained Doctor Dolittle and his animals in the first place (they were just there to go help heal some sick monkeys). In the original, King Jollinginki hated white people because of European exploitation of Africa. In this adaptation, he’s just kind of a prick for no reason. Every time you say “vaccinating,” Jenny McCarthy feels pain. Then, we get to the monkeys themselves. Clearly they are very sick because the illustrator decided to draw them as lanky brown aliens instead of monkeys. (Side note: the illustrations are horrendous in this book. I am no artist but of course no one pays me to draw things in books. Take a look again at the cover. See that owl. It is never drawn in profile in the entire book and most of the times has its wings outstretched for no reason. Further, it looks like it is on LSD.) 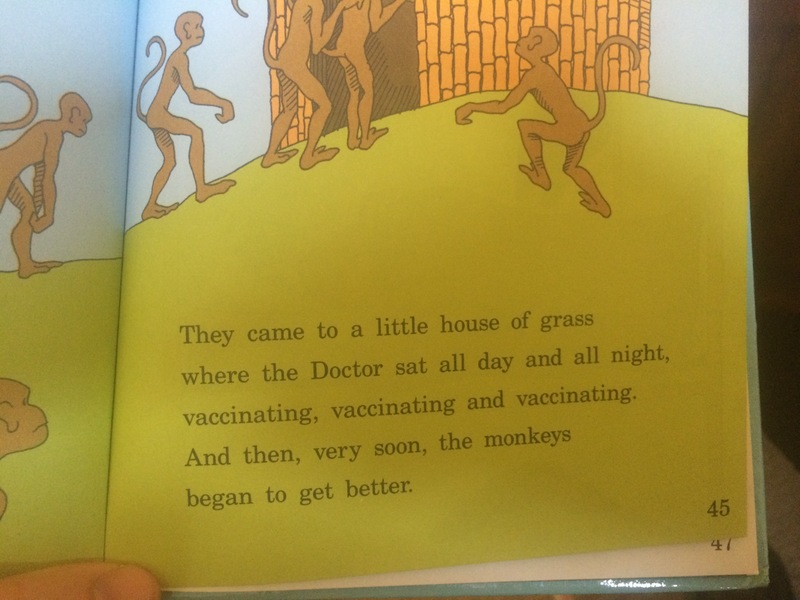 So Doctor Dolittle, being a trained physician, begins to treat the already-sick monkeys with… vaccinations. Now look, I know this is 1967 we’re talking about, but vaccines weren’t entirely new (Polio vaccine invented in 1952). And I understand the marketing aspect of encouraging kids to see that “vaccination equals not being sick” but it is medically and scientifically inaccurate. Even my ten year old looked at it and said, “Um, aren’t you supposed to get the vaccine BEFORE you get sick?” Maybe this is nit-picky (and again, I know it was published in 1967) but it goes to the broader theme I am building towards if you bear with me. 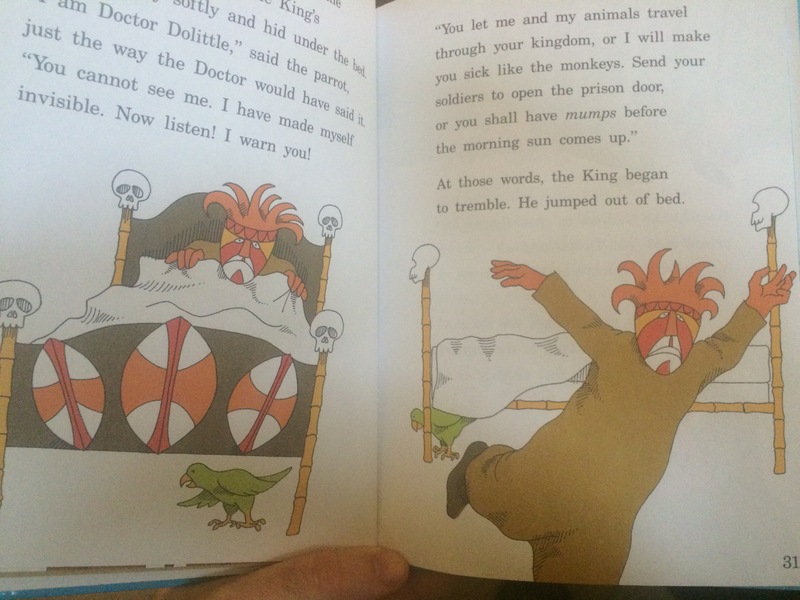 And I knew immediately that this book was going to talk down to my child like he were simple. Some may say to me, “but it’s an adapted book for beginner readers, they have to make it so little kids can understand it.” To which I say, “KIDS ARE NOT IDIOTS!” Adapting a story for young readers like pre-schoolers and kindergartners does not mean you have to dumb it down as though they are incapable of understanding simple things like character motivation and that someone being a doctor means they know a lot of things (seriously, that is the FIRST page of the book right there). A well-written story still has a coherent plot with a beginning, middle, and end. Sure, you may have to simplify your language some (but you don’t need to eliminate all multi-syllabic words!) but the STORY should still be a proper STORY. 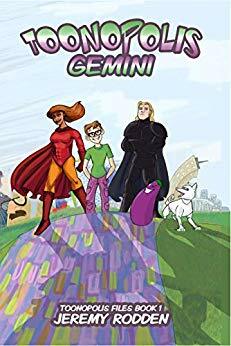 I find it offensive when children’s book writers (or adaptors in this case) “dumb down” material thinking that means they are making it accessible to children. Children are not dumb. They are more than capable of understanding character development, plot progression, and context clues to figure out words they may not know. To presume that they are not is to be doing them a disservice with the literature in the first place. If it isn’t challenging them and making them question things (“Why is the king putting Doctor Dolittle in prison?” “How did the Doctor cure monkeys by injecting them with weakened form of the disease they already had?” “The monkeys need to learn a lesson on consent and leave that poor pushmi-pullyu alone.” “Also, how does a pushmi-pullyu poop?”) then what is the point of reading the story in the first place? Maybe I’m just being pedantic but I don’t think so. As I’ve said a few times, I know this book was written in 1967 and Doctor Dolittle is a classic series, but this particular adaptation of the story rubbed me the wrong way. I know it is not the only one like this and I think it’s important to point them out when we see them and encourage even beginning readers to have access to better written (and better illustrated) books. Am I wrong or am I just being pretentious?